With a month between the German and Italian GPs, there was time for several teams to reorganize and at Monza the Honda team appeared for the first time with Ritchie Ginther driving the new Honda V12 car and Dan Gurney making his first appearance with the Weslake V12 in the back of his Eagle. BRM and Lotus fitted their cars with the BRM H16 engine and both Ferrari and Maserati had revised versions of their engines. The field was swelled by various extra cars including a third Ferrari for Lodovico Scarfiotti. Giacomo Russo ("Geki") reappearing in a third Lotus (with a Climax engine) and Chris Amon driving a privately-entered Brabham-BRM because McLaren was again missing. Giancarlo Baghetti was entered to drive a Reg Parnell Racing Lotus-BRM but when this failed he acquired an old Ferrari. Qualifying resulted in pole position going to Ferrari's Mike Parkes with Scarfiotti second and Clark third in the Lotus-BRM 43. 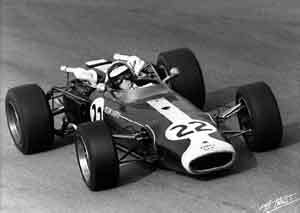 John Surtees (Cooper-Maserati) shared the second row with Ferrari's Lorenzo Bandini, while the third row featured Jack Brabham's Brabham-Repco, Ginther's Honda and Jochen Rindt in the second Cooper-Maserati. The BRMs of Jackie Stewart and Graham Hill were ninth and 11th because of gearbox troubles. At the start Scarfiotti and Parkes went into the lead with Bandini making a quick start to lead by the end of the first lap. Scarfiotti dropped back to seventh behind Parkes, Surtees, Ginther, Brabham and Hulme. Hill's BRM failed him and Clark found himself down in 10th. Ferrari's joy was spoiled on the second lap when Bandini pitted with a fuel pipe problem. Not long afterwards Stewart was out with a similar problem. Parkes led briefly but was then overtaken by Surtees but then Brabham took the lead until he went out with an oil leak after eight laps. By then Scarfiotti had fought his way back to the front. He was able to get ahead of the slipstreaming battle. On lap 17 Ginther suffered a tire failure in the Curva Grande and the Honda crashed into the trees beside the track. The American was (miraculously) unhurt but the new car was destroyed. This left Scarfiotti ahead of Hulme, Parkes and Surtees. On lap 32 Surtees went into the pits to retire with a fuel leak. He had been the only driver in a position to challenge Brabham for the World title and so the Australian - who was already out the race - celebrated his third World Championship success. Scarfiotti stayed ahead and finished six seconds clear of the battle for second which went (by 0.3sec) to Parkes. Hulme was third with Rindt a distant fourth.